County Down’s local fruit is a key element to their range of Gins. Matched with their own bespoke premium gin, fruits from the farms and hedgerows are macerated and soaked to create a range of juniper-forward, fruity Gins. Packing a punch at 37.8% alcohol, their gins aren’t to be missed. 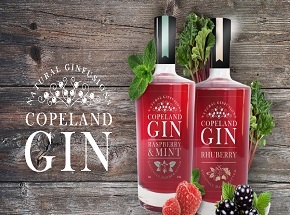 Available in 2 key offerings, Raspberry & Mint & Rhuberry, a mix of rhubarb & blackberry; Copeland Gin has further expanded into in-seasonal, small batch runs. These lovingly hand-crafted ginfusions are perfect for a classic Gin & tonic or mixed as part of a cocktail. Why not try a Copeland Bramble, or add a dash of Rhuberry to your favourite Prosecco? The possibilities are endless!